Last weekend Dimitar Gamishev successfully ran Uboot on A13-OLinuXino and later Slackware 14 and Ubuntu 12.04. So A13 Linux support is way ahead iMX233 for the moment. The WiFi, USB stack, 3G modem, LCD, USB-to-Ethernet and all goodies available under Android are also supported in Linux. Our major problem remain the video, A13-OLinuXino works fine with LCD but we still can’t set the video controller to generate decent VGA output. We spent over a week trying to identify and fix the problems without much success. The problem is that we have no access to the video initialization nor info for the A13 video registers, the initialization is made with Allwinner custom bootloader which they do not release as sources, but which can be “adjusted” by one text file where you write all video parameters. The problem is that this bootloader probably have bug inside as no matter how we setup the VGA signals the video in the setup file, the generator generate video picture in 16:9 format (which is OK for the LCD panel), so even if we set it to 800×600 pixels the video generator sends 1400×600 pixels which overlap with the synchro timing and make the picture to have some kind of shadows when displayed on 4:3 VGA monitor, these shadows dissapear on more modern 16:9 VGA monitors as probably they have some build intelligence to reconstruct even broken video input. So this definitely needs some more hacking. 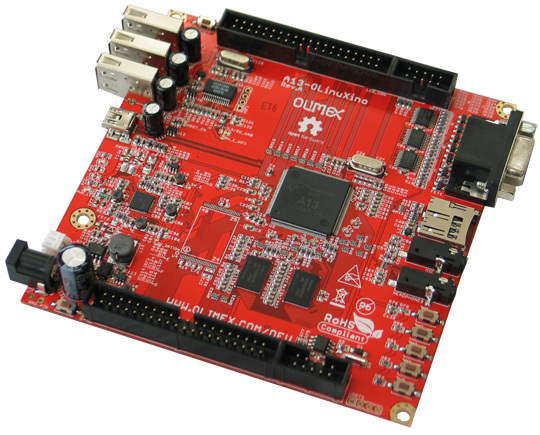 We start shipping the Developer edition of A13-OLinuXino Rev.B today and hopefully when more eyes can look at the code we can have better success on this issue. Good work, thanks for the progress update.